A charitable gift annuity is established when Purdue Research Foundation (PRF) and you enter into an agreement under which PRF agrees to pay you a fixed income for life in exchange for a gift of cash, securities, or approved real estate. These gift annuities can be for one or two lives and pay immediate income or deferred income. A charitable remainder trusts is established when you place assets into an irrevocable trust and name the Purdue Research Foundation (PRF) as trustee. The trust will invest the assets and agree to pay you or other named beneficiaries an income for life or a term of years. When the trust terminates, the remaining assets are used for the charitable purpose in Krannert. A charitable lead trust is a strategy for passing assets to your heirs. You place your assets in a trust and assign the income to Krannert for a term of years or the lifetime of an individual. The assets remaining in the trust at the end of the term will pass to your named beneficiaries with few or no tax implications. A gift of noncash assets can provide you not only with income tax savings, but also potentially provide you income in your retirement years. 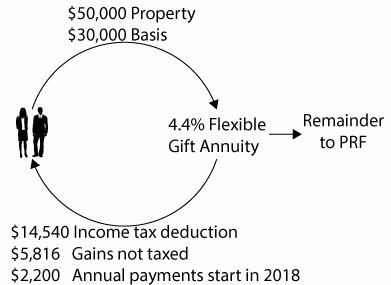 With a deferred gift annuity, you can receive a charitable income tax deduction now, and use a flexible start date so that income can be started when you are ready – such as in your retirement years. Flexible annuities use a range of possible start dates for payments. Each later date offers progressively higher payment rates. You irrevocably transfer $50,000 appreciated securities with a $30,000 basis to Purdue Research Foundation in exchange for an annuity with elective payment start dates that range from 2018 to 2036, for an annuitant, age 58. You will qualify for a federal income tax deduction of approximately $14,540. Your deduction may vary modestly depending on the timing of your gift. You may, if necessary, take unused deductions of this kind over the next five years. If you elect to start receiving payments in 2018, from that date forward, you will receive fixed payments in quarterly installments totaling $2,200 each year for life, at an annuity rate of 4.4%. In addition, $1,542 of each year’s payments will be tax-free for the first 24.9 years. If you defer receiving payments until you are 70 in 2028, your annuity rate will increase to 7.4% and you will receive fixed payments in quarterly installments totaling $3,700 each year for life. If you defer your annuity payments for the maximum 20 years, and begin receiving them at age 78, your annuity rate would increase to 12.1% with an annual annuity of $6,050!